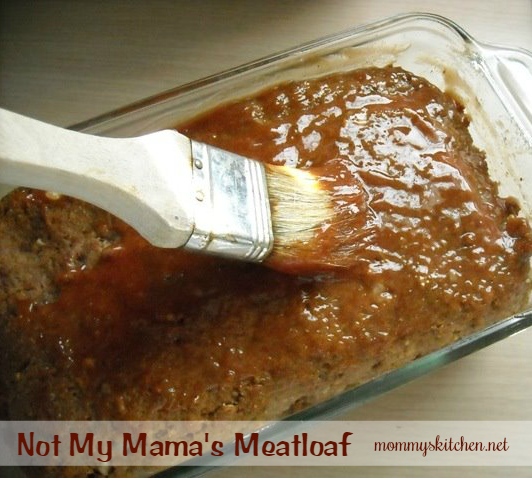 Mommy's Kitchen - Recipes From my Texas Kitchen: Not My Mama's Meatloaf! Not My Mam'a Meatloaf is an easy meatloaf recipe using a surprisingly simple ingredient, a boxed stuffing mix! All of the spices in the stuffing mix give this meatloaf a delicious flavor with a moist consistency. Meat loaf was never a favorite meal of mine growing up. I can remember that I always complained when mom served that big old loaf of meat. I'm not sure if my brothers and sisters felt the same way as I did , but I do remember one thing I was told to clean my plate, so that's what I did. When I was a kid I learned to be really good at washing certain foods down with my drink. I don't remember being too picky as a kid but My mother was a great cook I just remember meatloaf, Brussel sprouts and Lima beans were so un-appealing to me. Mom's meatloaf just looked like a big blob of meat with ketchup poured on top, and that is exactly how mom made it. Ugh. Fast forward to today and I can tell you my mother in law's meat loaf is a whole different story. That woman can make a smack down awesome meat loaf, no questions asked. It's the best homemade meat loaf you have ever put in your mouth. She definitely changed my opinion on meatloaf, so thanks mom. I usually use her recipe when I make meatloaf, but I was visiting the Sunday Baker and Tanya's meatloaf recipe intrigued me. It looked so darn tasty and a bit different than your normal meat loaf. Boxed stuffing mixed was used in place of bread crumbs or crackers and I couldn't wait to try her recipe. I said to myself, I bet the stuffing mix gives the meat loaf a great flavor. I prepared the recipe for my family and everyone loved it even my husband and he eats the best meat loaf of all time, so I was up against some pretty tough competition. Mom I love you and yours is still the best, but this comes pretty close to perfection in my book as well. I'm so excited to have two tasty meat loaf recipes. Do you have a certain recipe you disliked as a child but love now. Let me know in the comments section. Let's get started on making some meat loaf. These are the ingredients you will need: Ground beef, stove top stuffing mix, Lawry's seasoning salt, Worcestershire sauce, tomato sauce, 2 eggs, and minced onion. If adding a glaze to the top you can use ketchup, brown sugar and Worcestershire sauce. Start by crushing the stuffing mix using a food processor or a zip lock bag and a rolling pin. . In a large mixing bowl, combine all of the ingredients, including the ground stuffing mix. Using your hands, mix the meat loaf ingredients. Don't over mix or you will get a tough meatloaf! I chose to add a glaze on top, this is optional but so good. All I did was mix some ketchup, brown sugar and Worcestershire sauce together and then brushed half of it on top of the meat loaf and baked. In a food processor (or by hand) grind the stuffing mix until it's a fine crumb mixture. I don't like big chunks in my meatloaf. In a large mixing bowl, combine all of the ingredients, including the ground stuffing mix. For best results, do this by using your hands to mix the ingredients. Don't over mix or you will get a tough meatloaf! Mix until just combined and then press into a greased bread pan. In a small bowl combine the glaze ingredients and brush half of the glaze on top of the meatloaf. Bake at 375 degrees for 40 -50 minutes, or until juice runs clear and it's cooked through. Make sure to drain the loaf half-way through the baking. If you use a really lean burger, you won't have much to drain. Brush on the remaining glaze the last 5 minutes of baking. You can also use this recipe for meatballs or cook individual mini-loaves in greased muffin tins. Cool for 5 minutes and slice to serve. adapted from: the Sunday baker. We were on the same wave length again - I posted a meatloaf recipe today too! I love that yours uses stuffing mix instead of bread crumbs - fantastic idea! Looks great to me! Meatloaf is one of hubby's faves. I love meatloaf and that looks like a great recipe. As for your question the food I didn't like when I was little that I like now is chicken. If we had anything with chicken I would eat as little as I could get away with. Now if we go out to eat and there is a choice of chicken or beef in the recipe I choose chicken. And I make quite a few chicken dishes at home. Never tried one with stuffing mix- I'll give this a shot. Looks great! I love meatloaf! I make several different kinds, but this looks fab! You can't go wrong with Stove Top! 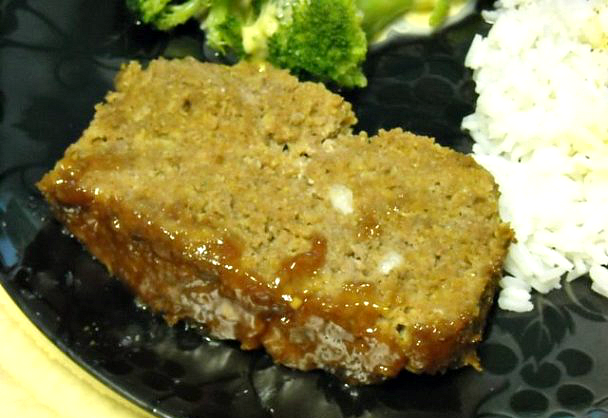 Not sure if you've tried it yet or not, but my absolute favorite is Paula's Barbeque meatloaf! If you haven't checked it out, you should!! What a clever idea to put Stove Top in meatloaf! That sounds really great, I'm going to have to try this! I've been making my meatloaf with stuffing for about a year now, but I use the herbed one and it's the best! I never liked it as kid either but love it now! Wow this recipe sounds so good! Sure going to give this one a try! Thanks so much! I love meatloaf and this looks so good. I think it's neat it used stuffing instead of bread crumbs. Recipes are fun that use unexpected items. This looks wonderful! I love meatloaf, but I've never tried it like this, yummy! I'm going to try your glaze the next time I bake me a meatloaf. I've been using stuffing in my meat loaf for a couple yrs now.I had to do it one day when I didn't have any bread crumbs and thought well what the heck,I'll try it.It was sooo good!It really adds something special to the same ol meat loaf! I am forwarded a Email/Comment. I thought It was a great idea so I watned to post it. I just got your meatloaf news letter and it looks YUMMY! Unlike you, I am a HUGE fan of meatloaf and am always looking to switch it up a bit! I am gonna give this one a try. But I wanted to pass along a little hint I picked up on the food network, I think from "Barefoot Contessa", Ina Garten, but not sure? Maybe you have heard this? She lines the bottom of the loaf pan with slices of bread, under the raw meat, when she bakes the meat loaf and it soaks up all the grease. It works great and you just peel it off when you slice it! I loved this hint and wanted to pass it along! I am still enjoying the Amish friendship bread you got me started back making a few months ago.. and I have made several of your variations! I loved the Strawberry Cheesecake one! YUMMY! Take care..and thanks again for doing your newsletter... I enjoy them SO MUCH! I'm stopping by to respond to the comment you left on my blog in case you didn't check back. Each of the recipe titles are links to the said recipes. That is all except the rolls. I can't remember where I copied that one from and I've already tossed the recipe. It needed too much work to repeat. Thanks for stopping by. am wondering if some old bay would work instead???? You know, I don't have a meatloaf recipe. I've never made meatloaf but my whole family loves it! We also love StoveTop stuffing, so I think we are going to have to try this recipe! Mmm, this looks like great meatloaf! I always liked my grandmother's meatloaf, but could never get it to turn out quite like hers. I finally found and use the Brown Sugar Meatloaf recipe from allrecipes... turns out pretty good, but still not the same! I think I'll give yours a try next time meatloaf is on the menu! I also made your Kool-Aid pie (using Fruit Punch flavor) and my oldest son DEVOURED it!! I just got your August menu and I AM SO WITH YOU! I am ready to get back into a routine. I have not made dinner for us all to sit down together hardly at all this summer! (I am gonna miss the sleeping in.. ugh) and I am gonna use your menu to try to get back into cooking meals! Thanks again for the newsletter..I really enjoy getting them. and you go a great job! I have made this recipe for sometime now, I also use cornbread stuffing mix. But instead of the tomato sauce, I use V8 juice, it gives it a little more tang, and if you want more of a kick, you can use the spicy V8. I LOVE this meatloaf. Ive made it three times now and it is sooooo good! Thank you so much for posting it! We love meatloaf and this sounds like a yummy recipe. I made this meatloaf for my family and they loved it!! My husband commented all evening on how yummy it was. I usually use seasoned bread crumbs for my meatloaf but for now on I will definately use the cornbread flavored stuffing mix..
Just pulled from oven and tasted.... very nummy yummy meat loaf! The tangy topping makes it perfect. I only had a pkg of sage stuffing mix but meat loaf is still delish. Will try other stuffing flavors next time. Oh, I also shaped four mini meatloaves and cooked for 20 min. Using low fat hamburger made zero drippings to pour off. This will be my go-to meat loaf recipe from now on. :) Thank you for sharing. I just made this for my family and it was a success!! Ever since I found this website I've been making more home cooked meals and the best part is that they turn out great! WOW!!!! This is beyond awesome! I am not a huge meatloaf person at all! I do not like traditional meatloaf one bit. It's a favorite of my hubbys, so when I came across this recipe this, week I knew I had to try it out! It was a huge hit! Everyone loved it!!! It was beyond awesome!!!! I will continue to make this meatloaf time and time again! I make meatloaf once a year and the last two years, the meatloaf recipes I tried were hardly edible. This is the first time I've made meatloaf that it actually had a really good flavor. The glaze was delicious! Next time, I am going to make extra to drizzle on the meatloaf after serving it -- sort of like a gravy. Mmm! Anyway this is my new go-to meatloaf recipe. I can't thank you enough for sharing it! I made this recipe and my husband who does NOT like or will eat meatloaf loved this recipe. He told me to make it again. Thanks for the recipe. I just put this in the oven, but I used green onions instead of white, and I added some finely chopped broccoli and celery. Here's hopin! I just googled "How to make a meatloaf that isn't tough" and I found your blog with this recipe. I just put it in the oven, I can't wait to see what it tastes like! This looks so moist and flavorful! Great idea to use the stuffing that's already seasoned! I'm like you where I grew up not liking meatloaf at all, but now I love a good slice with mashed potatoes! Looking forward to trying this recipe. I've got one of those two piece loaf pans, with holes in it, that drains into a drip pan. I find that a must when making meatloaf--no need to do the draining. I'm going to use the meatloaf mix (pork, veal and beef). I'll let you know how it turns out. This was delicious! I have tried a few times to make meatloaf and it always turns out like mush. I added a little garlic and pepper and put bread on the sides rather than draining the grease and I couldn't believe I finally made a great meatloaf! I am the same way!! I used to hate meatloaf!! I never made it unless someone requested it. I started dating this man this year and his favorite meal is meatloaf. So, I set out on a quest to find the perfect recipe so I could really impress him, lol. I found a good one. It turned out and now he says mine is the best he's had. Turns out, meatloaf isn't so bad after all once you find the right recipe. I want to try this recipe as well. Thanks Tina! I also was never a big fan of meatloaf as a child. My mother in law made the Lipton onion soup meatloaf and substituted A-1 steak sauce for ketchup! It's yummy! I am going to try this recipe for something different! Thanks so much for posting this! I never liked meatloaf growing up, but I tried your recipe and it was terrific! I used the cornbread stuffing, glazed it and used extra sauce like gravy as someone else suggested. Everyone loved it, even my kids who are suspicious of new meat dishes :) This is going in my favorite recipes! Thanks again! Can we have your mother in laws meatloaf recipe too? This has become my go to meatloaf. It is so delicious! It has also become my son's favorite dish that make. Thanks for the recipe! Hi. I didn't see the amount of ground beef for this recipe. 2 lbs. Or what ? It' s just my hubby and me .Anxious to try it .I'm disabled -wheelchair 24\ 7 and partially blind from Multiple Sclerosis so I really need to easy recipes for everything Never subscribed to anything like this but YOURS looks really hopeful :-)Thanks. The complete recipe is at the end of the post with the list of ingredients and the amounts for each. I think you are just reading the into that lists the step by step photos. tomato paste watered down to the right consistency and 8oz instead. 3 Tbsp. of Worchestershire sauce was maybe a bit too much for my family so I reduced this to 4 tsp. also didn't have any chicken Stove Top stuffing so used herb flavored instead. I have always loved meat loaf, especially when left over in sandwiches so am anxious to try this one. It is starting to smell really good and if it smells good it no doubt tastes good. Will let you know when I serve it with a baked potato and buttered green beans. Just reporting in after dinner. Oh my goodness, the meat loaf was wonderful, moist, great flavor (next time 3Tbsp. Worchestershire Sauce)and the crust on the top was crispy and delicious, I will be making this again, hubby loved it, even went back for seconds. Thank you for such an amazingly good meat loaf recipe. I'm so glad you liked it Joan. A happy hubby is always a good sign. That recipe is our favorite as well, and I really think the secret is in the stuffing mix. Thank you for stopping back by and letting me know. I had never made meatloaf until I came across your recipe a few years ago. My kids, who r now 12&15, love meatloaf and don't understand why their friends don't feel the same way. I think it's because their moms don't know this recipe! This, and your hash brown crockpot casserole (which I make using tater tots because I find them on sale a lot), are their very favorite foods. Yay! I'm also popping in to ask that you post your mother in law's meat loaf recipe too.